I was chatting with a friend recently, and she mentioned that she likes the idea of tempeh, but every time she plans to make it and goes searching for recipes, she gets overwhelmed. “Do I really have to steam it first?” she asked. “Is it that bitter?” My answers were no, and no. For the most part, I think that tempeh can be really easy to prepare, so long as you use a good marinade. Today, I’m sharing my favorite lemon pepper baked tempeh cubes, which can be used to add flavor and a protein boost to any grain bowl or salad. The idea behind steaming tempeh prior to cooking is that tempeh has a naturally bitter taste. To me, it tastes more earthy than bitter, but in any case I understand that it’s a distinctive and unusual flavor if you’ve never encountered it before. I’ve never found that steaming tempeh improves it very much, though: instead, I like to marinate tempeh strips or cubes before I cook them. I find that this takes away any of the bitterness, and it also allows them tempeh to soak up plenty of flavor before cooking. Once the cubes are baked, you can use them for essentially any type of dish. As you’ll see, I love to pair them with rice and veggies in a grain bowl, but you can also throw them onto a lunch salad for quick, easy protein, stuff them into your favorite wrap, add them to tacos, or even use them to top a bowl of savory oats. Personally, I love to pick up on the lemony flavors by pairing the tempeh cubes with an easy batch of the herbed rice I’m sharing today and whatever veggies I have on hand. 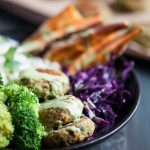 I use roasted broccoli in this particular recipe, but beets, roasted carrots, sweet potato, rutabaga, or cabbage would all be great additions! As would a scoop of homemade lacto-fermented veggies, kimchee, or hummus. ¼ teaspoon (heaping) black pepper, plus extra. Whisk all of the ingredients except for the tempeh together in a small bowl. Place the tempeh cubes in an airtight storage container and pour the marinade over them. Cover and shake the container so that the tempeh is coated on all sides. Allow the tempeh to marinate for at least two hours in the fridge, or up to a day (I usually do it overnight). Preheat your oven to 350F. Place the tempeh cubes on a parchment lined baking sheet and give them an extra turn of black pepper. Bake the tempeh for 15-20 minutes, or until the edges of the cubes are golden brown, flipping the cubes over halfway through baking. Serve. Leftover tempeh cubes will keep in an airtight container in the fridge for up to 4 days. Soak the brown rice overnight, if possible. To prepare the rice, put a medium sized pot over medium/low flame. Drain and rinse the soaked rice and add it to the pot. Toast the rice, stirring constantly, until it appears dry and smells nutty. Add 2 cups water (or low sodium vegetable broth) and bring the rice to a boil. Lower to a simmer. Cover and simmer the rice for 30-40 minutes, or until all of the water has been absorbed. Fluff the rice with a fork and allow it to rest for a few minutes. Place the onions, garlic, lemon, oil, salt, and pepper in a food processor fitted with the S blade. Pulse until the herbs and onions are finely minced. Add the mixture to the rice and stir well to combine. Check for seasoning and adjust salt and pepper to taste. To assemble the bowls, pile four bowls with 1½ cups kale or other greens. Top the greens with ½ cup broccoli, a heaping half cup of the rice, a quarter of the tempeh cubes, and a nice drizzle (2-3 tablespoons) of lemon hemp dressing. Serve. Leftover rice will keep in an airtight container in the fridge for up to 2 days. I love what the creamy hemp dressing adds to this bowl: a little extra lemony zing and a creamy texture that contrasts so nicely with the crispy greens and broccoli. Of course, you can use any favorite dressing here; my delightfully green tahini dressing, turmeric tahini dressing, or creamy hemp basil sauce would all be great. A simple vinaigrette would also be fine, or just some avocado slices and a squeeze of lemon! This is a hearty bowl of ingredients for cold days. I’ve always thought that there’s something particularly nourishing about tempeh. Maybe it’s the knowledge that I’m getting protein, calcium, B Vitamins, and zinc; maybe it’s the hearty texture or that earthy, grounding flavor. Whatever it is, it makes including tempeh in my meals a pleasure, and lemon pepper baked tempeh cubes are a pretty fun, low stress way to do it. Hope you’ll enjoy the cubes and the bowl! I’ll be back on Thursday with a spicy, lemony, and seasonal vegan pasta recipe. I have actually never tried tempeh but I have been wanting to try it in forever. I think I’ll see if I can find it in my health food store. The dish looks really good. It’s -2 outside, but this recipe is warming me up just looking at it! YUM! This looks so amazing!! I’m pinning this now. MUST make soon. I love tempeh, but I fall into ruts and do the same marinades over and over. Yay! Hope you like the bowl, B.
I am definitely like your friend who gets a little intimidated by making tempeh! Definitely like this beginner-friendly recipe. Hope you love it, Linda! I love tempeh a lot and it’s easier on my digestion than tofu. And bless you for making a marinade recipe that doesn’t call for garlic! I am on FODMAPs diet and garlic and onions are so tragic for my GI distress–and almost every recipe for marinades (etc) calls for garlic. I leave it out, but I always feel like I’m missing something – so it’s great when a recipe is developed to have maximum flavor without the garlic! 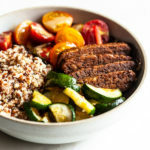 I’m going to double this and keep it on hand for lunch grain bowls! Yes, and store-bought is worse: EVERYTHING has garlic and onions, usually in more than one form. I literally read a label the other day for a sauce that had dried garlic, garlic paste, onions, and dried onions!! I could feel the GI distress just thinking about it! 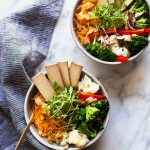 I really need to try Tempeh, I follow the Fodmap diet which helps my IBS incredibly but i’m not a fan of tofu so this looks like a better alternative! I’ll try and make this and tweet you a picture! I love the photography, especially the horizontal image of you holding the bowl! The recipe sounds delightful too. Deliciously interesting! I’m going to do more research on tempeh but if you were to compare it to another food item, what would it be? What are its components exactly? My husband loves tempeh while I’ve never gotten into the texture. Do you think I could use extra firm tofu for me? Definitely. Tofu, so long as you get the extra firm stuff, will work well here! It’s been such a long time since I’ve cooked tempeh, and you’re convincing me that I need to go pick up a block of it soon! One of my favorite recipes is from Heidi Swanson’s Super Natural Every Day, and it’s tempeh that’s baked in a pomegranate glaze. I agree with you, as long as the marinade is good, the tempeh will taste great. Thanks for the recipe inspiration, Gena! Recipe is really amazing. I loved it. Gena! I had to tell you this was our first official meal in our new house! I didn’t look at the instructions ahead of time, so I didn’t realize there was marinade time involved. Oops! But! Instead, I tossed it in a container a few times over 15 minutes, then pan cooked it with all of the marinade sauce for about 10-12 minutes over medium until deeply golden brown. It was fabulous! I made quinoa and steamed broccolini for sides and doused it all in your deeeelicious hemp dressing. SO good. My other fav tempeh recipe is the orange pan-glazed tempeh from 101 Cookbooks. Another super simple thing I like to do with tempeh is make BBQ sandwiches. I thinly slice the tempeh, fully cover in a baking dish (parchment lined) with BBQ sauce, and bake at 350° for about 20-30 minutes. The tempeh becomes super tender when cooked in sauce. So so good + easy! 🙂 Thanks for this killer recipe! I actually just started hearing about steaming tempeh. I have never done it before, I definitely do not find it bitter. I’m more like you and find it earthy. This sounds super delicious – I will be making this soon! One regret though: why haven’t I done more of it?? Thank you Gena, from one of your French fan! Wow! We made this for dinner tonight and it was absolutely incredible. The tempeh, especially, was just perfect (we only marinated it about half the day and it turned out great). Because there was leftover marinade and we didn’t want to waste it, we actually used it to saute some red cabbage and had that instead of the greens. The rest we kept the same except we omitted the oil because we are oil-free. That hemp dressing… drool! Will definitely, definitely be making this again. Thank you! I must be the only person on the plant who likes the taste of tempeh just the way it is, well cooked, anyway. I prefer it fried – which means I don’t get my preference very often – lol. I crumble it into pasta sauce, marinade and bake it, toss it in with my greens. But, I suspect my bitter taste receptors are outside the normal curve. I love the taste of a lot of things other people say are too bitter.